The Telegraph run a weekly travel photography competition called the Big Picture. I decided to enter one of my monkey moments– taken at the Jigokudani monkey park in Nagano, Japan. I was pleasantly surprised with a runners up position! See it on the Telegraphy website here. See some more monkey moments. Thanks 🙂 I was pretty pleased! Very exciting, and a great photo. Congratulations! Thanks! I was pretty pleased with it. I might have to track that monkey down and give him a banana! He’s winning me a few things. This photo really reaches out and grabs you — congrats! Congrats on both honors, here and in The Telegraph. He looks deep in thought. Congrats on the competition and being freshly pressed! Amazing (and hilarious) photo. Well done! Thanks 🙂 He does look quite funny with his spiky red hair and sunburn! Congratulations and now you can add Freshly pressed to the list of awards! Such a lovable face. It is almost human! Thanks so much! It really is so human, like there is understanding in his eyes. Great photo! Congrats on being a runner-up and being freshly pressed! Thanks so much! You have some amazing photos on your blog! What a picture! Love it! And I love the hairdo, heheheeh. If this one came second, what was first? Hard to beat, I’d say. Ha. I just saw it was the picture with the Northern lights. Duh. Forget my question. I’ve seen these guys before.Love it. To cool, literally , to cool….. Fantastic! What an adorable picture! Thanks! He is pretty adorable 🙂 Especially with his hair cut. That is the cutest monkey! To bad I’ve seen the crafty buggers up close and know not to get near them. They are cute though! He looks like he is planning mischief! Congratulations! Female toque macaque monkey? Awesome photo. haha thanks! It does look like he has been tussling his hair, I wonder where he found some monkey gel 🙂 Thanks for stopping by! I’ve always thought that the runner up photos are usually better than the winner! Well done. Thanks! The winner was pretty good but, without being too modest, I felt as though mine maybe could habe won. I mean the Northern lights are pretty, but do they have big soulful eyes and a punk hair do? But a fantastic photo! Congratulations! Thanks! He is a little creepy, like he is planning some mischief. Congratulations! This is a beautiful picture – you’ve captured pure innocence. 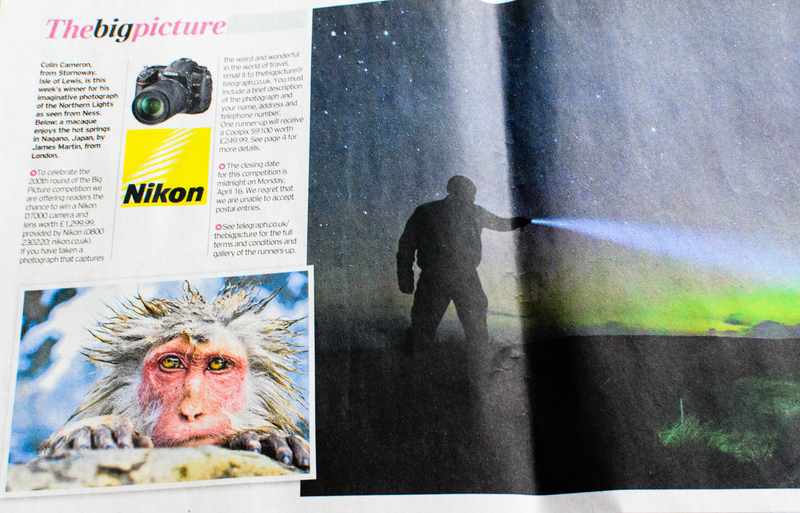 Love the Monkey Pic – Congrats in making it in the paper as well as FP – YAY!!! Congrats! This is an amazing and beautiful photo. Is he trying out for a Punk band? A photo of inquisitive and hungry eyes or could it be something entirely different. I think you have captured something without words that explains tomes of info. Great posted photo. I love this! Such a great shot. I could stare at that little face all day. Congratulations on making runner up and on freshly pressed! Congratulations! Great shot, deserving placement. I’ve felt just like that on a number of occasions! Usually in the morning after a rough night. Congrats also on being freshley pressed! Congratulations! I actually liked your shot better than the winning one, though both are beautiful. 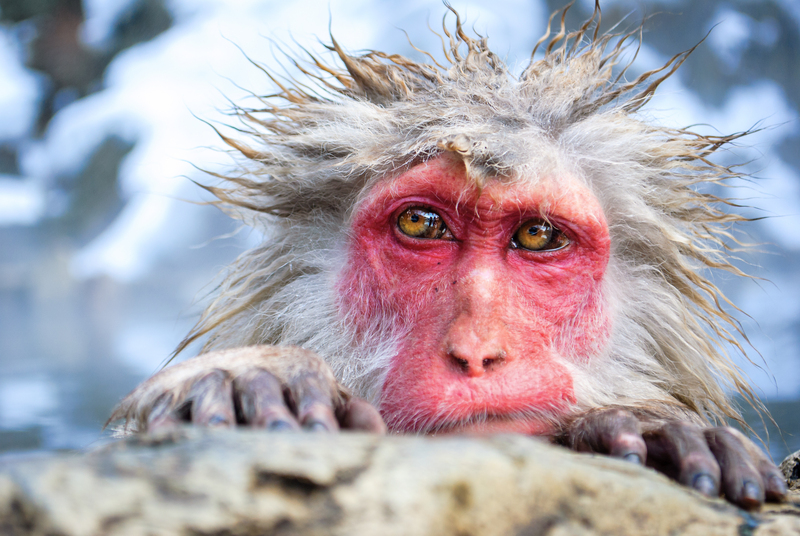 I love the detail and expression you captured in the monkey’s eyes. Extraordinary. Great catch. Wonderful snow monkey. Very unusual picture and great eye for the shot. Congrats! That poor monkey looks just like me after falling asleep sunbathing! Congrats! also please check out and follow my blog at dailyadvice101.wordpress.com. Thank you very much! WOW! This is a great image! cute picture. teaching a lesson as well. just try out everything . Really inspires me to take my own photos, just for the shear pleasure of viewing its beauty. Really fantastic picture. Oh my god! What an amazing photo! i don’t actually think i have seen anything like it! it has left me all inspired lol , great work!! A thinking being that portrays warmth and a disinclination to be photographed rather than hogging the limelight. A moment, a great one. Well done! The picture is amazing. I was short listed in 2010 for the big picture competition in 2010. I tried again recently but didn’t get through, which only makes my previous success more valuable. Great blog! So much depth in those big brown eyes… Incredible shot! I am impressed by this photos deeply! Good shot of the face. congratulations! wow what a face on this little guy!! the photo looks really interesting as your cover photo up at the top there!! such a different perspective! Congrats, it’s a great photo in fact amazing…. Amazing shot! I adore macaques and this is one of the best pictures of one I’ve seen. Congrats, it’s a fantastic picture. Congratulations on the double achievement! 🙂 Great pic! That is a fantastic picture. I love the “dreads” and bright pink face! Great job! I like your entry. Wonderful photo, and huge congratulations! what a red face !! Hey my photographer followers who travel, check this post out! I would love to see your work apart of this competition! If you do or have done this before, please let me know!! !